A few days ago, one of my readers, Elisa, asked me to write a post about Christmas traditions in Italy. This is not as easy as it seems because every Italian region has its own Christmas customs, many of which I’ve only briefly heard about but never personally experienced. So here, I will only talk about those few traditions that are common to pretty much the entire country, and those that my family follows. In Italy, the Christmas season begins on December 24 (Christmas Eve) and ends on January 6 (Epiphany), and many of its customs are dictated by and find their origin in the Catholic Religion. One of the main Christmas decorations, which can be found in most houses, pretty much every church and sometimes, but always less often sadly, in schools and squares, is the presepe, which is simply a representation of the Nativity scene. It can be really small, with only little statues of Mary, Joseph, Jesus (which is usually placed in his manger on 25th December), a donkey and an ox, or, if you have more space, can also include statues of the angels, the shepherds and their sheep, and all the other inhabitants of Bethlehem and the surrounding regions on their way to pay homage to the newborn baby. On 6th January, the statues of the Magi, who have finally arrived with their gifts, are also added. Some of the decorations for the presepe can also be handmade. This can be quite fun, especially for children. I remember that when I was little, me and my sister would go out in the garden to pick up musk, grass and pebbles to make the earth and roads, then we would get some aluminium foil and shape it like a river, and finally we’d colour a big piece of paper blue and draw some stars upon it to make the sky. This tradition is very old. 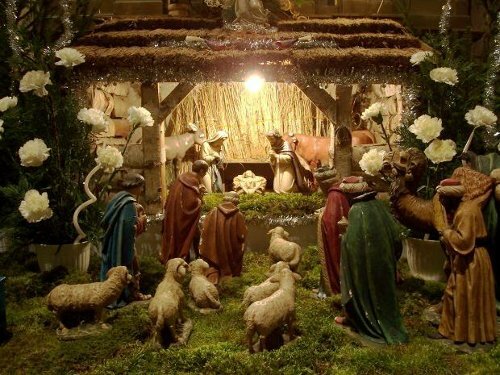 San Francis of Assis is credited with having realised the first live presepe, using real people, in 1223. Soon, this custom spread all over the country and is still very popular nowadays, especially at Naples, where the inhabitants craft beautiful, and very detailed, statues for it that are really little works of art. 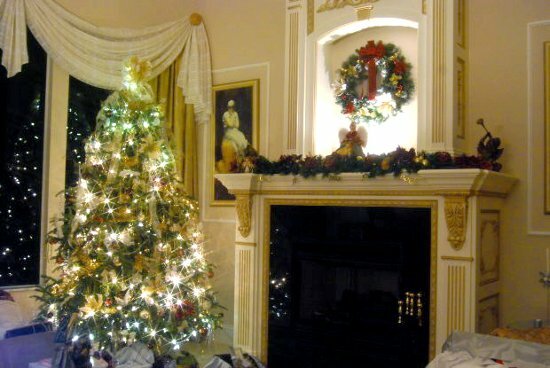 The other most popular decoration is the Christmas tree, which is embellished with tinsels, balls, and other little decorations, while on the top is usually placed a star. This tradition originated in Germany and became popular in Italy only at the end of the 19th century, when Queen Margherita of Savoy introduced it at the Quirinale Palace. The tree is usually decorated on 8th December, the Feast of the Immaculate Conception and put away on 6th January, the Epiphany. I prefer to put it away the next day though, as I love to see all the Christmas decorations around the house and want to make that festive atmosphere they create last a little bit longer. Most families gather together on Christmas Eve for the cenone (it means big dinner), which involves several fish courses. Catholics can’t eat meat on Christmas Eve, a custom that dates back to the Roman Catholic tradition of abstinence, which forbade the consumption of meat and milk on Wednesdays, Fridays and Saturdays, Lent and on the eve of specific holy days, such as Christmas. Meat is instead allowed on Christmas Day. The most popular dishes for the occasion are stuffed turkey, lamb and cappelletti (they’re similar to tortellini and stuffed with pork and Parmesan cheese) in broth. There are several delicious Christmas desserts too. 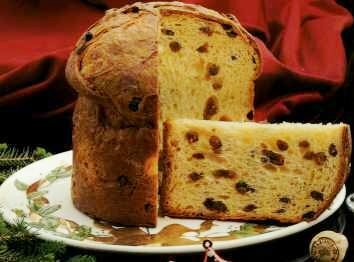 My favourite is Panettone, which is a cake filled with candied fruit and raisins (some can contain only chocolate, but they’re not very tasty, oddly). Then there’s Pandoro, which is a Panettone without fruits and raisins, but dusted with sugar on top; Torrone, also known as Nougat, which is made up of honey, egg whites and toasted nuts; and Panforte, a gingerbread with hazelnuts, honey and almonds. Families and friends also reunite on New Year’s Eve for another cenone. Typical dishes include the zampone (the skin of the lower pig leg filled with ground pork meat and rind mixed with spices), cotechino (a large size sausage filled with pretty much the same type of mixture) and lentils. Santa Claus (called Babbo Natale in Italy) doesn’t really need any introduction. He brings gifts to children all over the world, Italy included. Although many foreigners believe that it’s the Befana (more on her in a bit) that brings presents to people and that thus presents here are exchanged on 6th January, this is not exactly true. It may have been true once, and it may still be true in some parts of the country, but these days children believe that it’s Santa Claus that brings presents and it’s to him they write letters asking for toys or anything else they wish (Befana brings something extra as we’ll see in a while though). The presents are opened on Christmas morning, after they’ve spent a sleepless night well tucked-up in their beds, full of the excitement for what they are gonna find under the Christmas tree. And the next morning, they wake up their parents really early to open them. Some people, however, prefer to swap presents on Christmas Eve. The Befana is a kind of old witch who flies on a broom and, on 6th January, brings children sweet and toys if they’ve been good or charcoal (these days she actually brings carbone dolce, a rock candy that looks like coal) if they’ve been bad. According to the legend, the Three Wise Men stopped at her hut to ask directions on their way to Bethlehem and invited her to join them, but she refused. Later, a shepherd asked her the same thing and she said no again. That evening, Befana saw a great light in the skies and thought that she should have gone with the Three Wise Mean after all. So, she gathered some toys that had belonged to her own baby, who had sadly died, and went out to look for Baby Jesus, but she wasn’t able to find him. Every year, she keeps looking for him, and each year she can’t find him. So she leaves her presents (or charcoal) to the children of Italy. 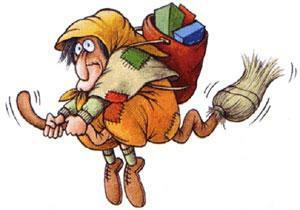 Some people also believe that Befana, who lives at the South Pole, is Santa Claus’ wife and that she brings gifts to those children who, for lack of time, her husband hasn’t been able to reach. In some parts of Italy, Santa Lucia or Baby Jesus are the ones who bring presents to children instead than Santa Claus or the Befana. However, in my neck of the woods, we open Christmas gifts (brought by Santa) on Christmas Day and receive sweets (or charcoal) and only sometimes toys on the Epiphany. I hope you enjoyed this post. How is Christmas celebrated in your country?